At an event held at the State Capitol this week, The Afiya Center, a Black woman-led reproductive justice organization based in Dallas, released an intersectional report highlighting how the current political climate in Texas has created socioeconomic and health disparities among Black women. The report — and the accompanying legislative briefing, which can be viewed below — provide an in-depth analysis of how state policies decimating critical women’s health programs over the last decade, coupled with the impact of systemic and institutional racism, have lead to a decline in the overall health of Black women and growing disparities in maternal mortality. Texas lawmakers have consistently presented and passed legislation that has had a devastating impact on the quality of life for women by limiting their reproductive choices. With continuous funding cuts and restrictive policies limiting abortion access, it is apparent Texas politicians have little regard for the health of women in this state. In fact, Texas has the worst maternal mortality rate in the developed world. Overwhelmingly, these disparities disproportionately impact Black women. At the Afiya Center, we know Black women need resources, opportunities, and support to protect our human right to health and life, and allow us to make the best decisions for ourselves and our families. 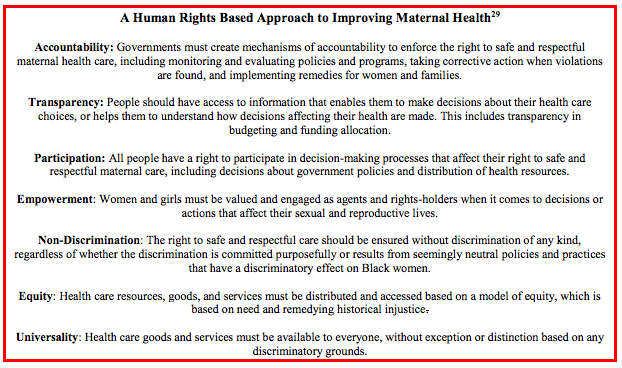 Included in the report is a roadmap of human rights-based policy solutions aimed improving maternal health and overall health disparities of Black women.